The example is made in DK weight cotton/silk yarn, but can be made with most yarn weights. The beginning chain should be a multiple of 58 plus 34. Row 1: Dc in 4th ch from hook, dc in next 7 ch, 5 dc in next ch, dc in next 4 ch, dc5tog (uses next 5 ch), dc in next 4 ch, ** 5 dc in next ch, dc in next 12 ch, dc5tog (uses next 5 ch), dc in next 4 ch, 5 dc in next ch, dc in next 4 ch, dc5tog (uses next 5 ch), dc in next 12 ch, 5 dc in next ch, dc in next 4 ch, dc5tog (uses next 5 ch), dc in next 4 ch. Repeat from ** to last 9 ch. 5 dc in next ch, dc in next 8 ch. Row 2: Ch 3, turn. Dc in 2nd dc, dc in next 8 dc, 5 dc in next dc, dc in next 4 dc, dc5tog (uses 2 dc, dc5tog, 2 dc), dc in next 4 dc, ** 5 dc in next dc, dc in next 12 dc, dc5tog (uses 2 dc, dc5tog, 2 dc), dc in next 4 dc, 5 dc in next dc, dc in next 4 dc, dc5tog (uses 2 dc, dc5tog, 2 dc), dc in next 12 dc, 5 dc in next dc, dc in next 4 dc, dc5tog (uses 2 dc, dc5tog, 2 dc), dc in next 4 dc. Repeat from ** to last 12 dc and turning chain. 5 dc in next dc, dc in next 8 dc. Repeat row 2 until afghan is desired length. Finish off and weave in end. Thanks for all the options. Sure saves mishaps when I figure wrong. Love the new looks for chevrons.. I was thinking to have something that would brighten my all browns living room, and looking at the colors in your afghan, seems like it would really add a sparkle to the room. I’m not a creative person, but I can follow directions. Thanks so very much for sharing! My mom used to make these frequently. This will be my first. Plan to use my stash to make it. “dc5tog (uses 2 dc, dc5tog, 2 dc)” – the portion in parentheses is telling you the five stitches from the prior row that the dc5tog will be made into. This is just to double check that valleys are lining up. Never say you are not a creative person….I cant follow directions either but I love looking at the different designs. Creative is not designated for just those that create their own patterns. Creativity comes in many forms.. I really like the bright colors you use for this pattern. Could you please tell me what brand and colors are in this pattern? Thank you. just want to say thank you for your great patterns and instructions!Being from Australia,and it being quite cool at the moment;i can hardly wait to begin this!! 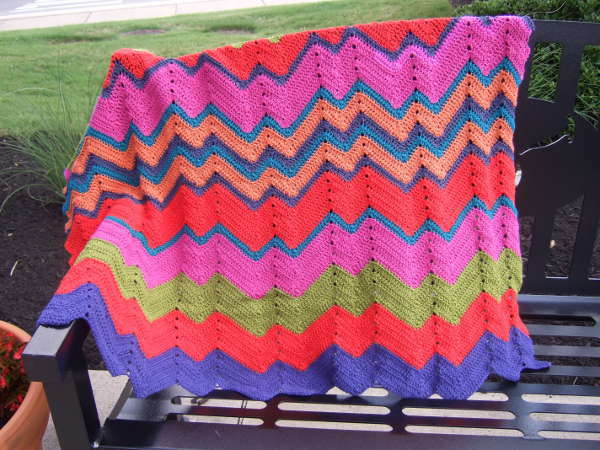 this is a beautiful Afghan, would love to make it. I am having trouble with the edges staying straight. At the end of row two it says work until there are twelve sts. and chain 3 left. Then it says to dc in next 8 sts. that leaves sts. left over. When start next row there are more than the nine dc you start with to get to center st of 5dc group. There will be stitches left unworked at the end of each row. At the end of row 2, you will have a 5 dc in one and then 8 dc. You leave the other stitches unworked. When you ch 3 and turn, that chain counts as a dc, so you will not need to make a dc in the first dc. The next 7 dc will be made in the remaining of those last 8 dc of row 1. Then the last 2 of those 9 dc are worked in the first 2 dc of the 5 dc in one. That sets you up to make your 5 dc in one in the center of that “peak” from row 1. Does this mean that the edges are uneven? This is the way my sample is turning out, Is there anyway to keep the edge straight? Thanks so much for your help. I made your Knitted Carnival Afghan, it was beautiful, Thanks again for all your patterns and help. They are uneven, but after several rows, actually just makes it look like the edge is rippled. Thanks for getting back with me, Looking forward to making this pattern. Thanks again for the patterns. You don’t need to do anything about the “uses” parenthetical comments. They are just there to clarify into which stitches of the prior row the dc5tog is made. If the dc5tog is made in those stitches from the prior row, then the blanket “peaks” and “valleys” will align correctly. Hi, I’ve made other of your patterns and loved them. This one is stumping me on one point. The afghan gets wider an wider and the edges are not straight. What am I doing wrong? I even tried DC2tog on each end and it just makes it get wider at a slower pace, LOL. It has to be me, I’m sure. Any help is appreciated. Oops, I just read your explanation to someone else and now I see I did the entire afghan incorrectly, TWICE. Guess it would have been helpful to read the comments before I did it, eh? Sorry for the inconvenience. I have done other of your patterns and they came out nicely. I love this blanket! However, I have started twice and end up on the fourth row with too many stitches. I read your response to Sue, explaining I should leave those stiches and turn for the next row. Could the reason be because when we decrease, we lose 4 stitches but the increase is for 5 stitches? Both the increases and decreases are for 4 stitches (the 5 stitches in the increase are made in one stitch, so increases 4 stitches, from one to five). In some ripple blankets, including many of mine, the increases or decreases at the beginning and end of the row are actually half increases or decreases so that the edges are actually on the level. In this blanket, there are full increases on both ends. This makes a half increase on each end that is not counterbalanced by a corresponding decrease. Over two rows, this results in 4 extra stitches. Those are the stitches that are skipped at the end of each row. I love the easy fast steps to this afghan. The pattern is easy to remember and very quick to make. Thank you for the pattern. Hi, I just can’t follow these instructions. Stuck on (uses next 5 ch)and why are no chains skipped for valleys? The stitch used in the valleys is dc5tog. It is made into 5 ch because it basically has the bottom of 5 dc, but the top is a single stitch, so the top of one dc. The (uses next 5 ch) instruction is clarifying that when making the dc5tog, it will be made into these next 5 ch. Since the stitch reduces 5 stitches to 1, it forms the dip for the valley, but doesn’t leave a gap like skipping stitches does. Hopefully I can help. What specifically needs clarification? I am having problems with the counting. I don’t get finished with the last part one row one before I need to leave 9 stitches. it ends with 12 DC. but when i chain 3 and turn to go back for row 2 i can work the DC 8 st. and 5 DC in one st. but the then when it says to DC next 4, I have 12 DC from last row, not 4. I’ve counted my chains and recounted 266chain is the width i want. Please help! I want to make this so bad. I have a love/hate relationship with this pattern. I want to make it so bad but it doesn’t look right and the ending of each row never adds up. After I do my 5 DC I have so many stitches left. It looks terrible when I tried to follow the pattern. I have been just adding 12 dc and turning to make it look even. What am I missing? What EXACTLY do I do after the 5DC? How many DCs? If you don’t leave those stitches at the end of the rows then the ends of the rows will grow longer and longer, making the blanket wider and wider. After several rows of those staggered ends, the sides actually have a ripple as well. I just saw this pattern and I love it. Can you please tell me your row count for each color? Thank you! The broadest bands are 4 rows. The sort of royal blue and teal stripes are a single row. The goldenrod looking stripes are 2 rows. Absolutely! It will look great. Follow all the directions in order after “Row 1:” until you get to “Repeat from **”. Then follow the directions between the two sets of ** over and over until you get to the last 9 chains, then follow the remaining directions of the row. You will not work to the end of the row. Because of the ripple pattern, the end of the rows will be staggered and over a few rows will actually form a ripple on the side. I am sorry that I am asking you to clarify row 2 again. I’ve read all the remarks and I’m afraid I’m still having issues with the math. I fully understand about leaving stitches unworked, that makes sense to me. However, when turning, even working the first DC into the second stitch, and then the next 7dc in the remaking stitches from first row, you have two extra stitches left at the up ripple. Are you saying to decrease those stitches into the up ripple 5DC in 1DC? So, decrease by two stitches? I’m am sorry that I’m not understanding it better. But I just ripped out 25 rows of this pattern (that I really want to do) and I can’t see how to work this. Any clarification would be helpful. Thank you! I’m sorry you’ve had to rip out stitches and restart. I assure you once you get the rhythm of this pattern that it will go fast and much easier. The very end of row 1 is “5 dc in next ch, dc in next 8 ch”. Coming back with row 2 “Ch 3, turn. Dc in 2nd dc, dc in next 8 dc, 5 dc in next dc” – The ch 3 comes from the first of the 8 individual dc. Dc in the 2nd dc. Now there are 6 individual dc left before the 5 dc in one of row one. When you dc in the next 8 dc, this is using those 6 individual stitches plus the first 2 of the 5 dc in one of row 1. Now you are at the center stitch of the 5 dc in one from row one and the 5 dc in one for row two will be worked in this stitch. The 5 dc in one will always be worked in the center stitch of the 5 dc in one of the prior row. It can be done a couple of different ways. You can have dec3 stitches on both ends of the rows or you can have dec3 stitches with a few dc stitches to make a border. Hi Mama, I have made several of your patterns but this is one of my favorites. However my old fingers are not happy with a pattern that starts with a chain and soI wonder if it can be converted to a no beginning chain pattern. I will look forward to hearing from you and must compliment you on your beautiful patterns and I know from past experience that you are kind enough to respond to all of your fan.!! The way I do a no chain foundation wouldn’t work for this one, but there is another type that would be more adaptable for this blanket. In that method, you make a very short chain and a dc, then for the next dc make a tr around the post of the prior dc, then for the next dc make a tr around the post of the prior tr. The tr stitches replace the dc stitches of the first row and the foundation ch stitches. There are websites and videos about this method. I just wondered whether you have ever done a straight edge on one end? I have made this up into a baby blanket and would love the top edge to be flat. I’ve tried using the method for Ripple patterns, but as the waves are uneven, it’s really hard to get it to lie flat. Do you have any suggestions? I loved the pattern, by the way and really enjoyed making it up! I don’t know about this method for ripple patterns, but would love to see it. Is it available online? I might be able to modify it to use with this pattern.